If you’re looking to buy an electric skateboard that you can use for fun, to commute or to just get around from place to place, then you’ve come to the right place. The following information is going to put you on the right path to finding the perfect scooter for you. Not only will you find information about what you should look for in an electric skateboard, but you’ll also find some top product recommendations that would be perfect for you. There are a few important factors that you will need to look at before you make your decision. If you’re looking for one of the better and most expensive options on the list, then this Yuneec E-GO2 is definitely going to be the skateboard for you. While the price is the second highest out of all the ones reviewed here, you’ll quickly see the value in it after going over the features that this has to offer. Most importantly, you’re going to love the shape of this board as it will help you better control the board. As mentioned above, the kicktail shape of this skateboard is a huge bonus because it allows you to have more control and gives you better steering overall. 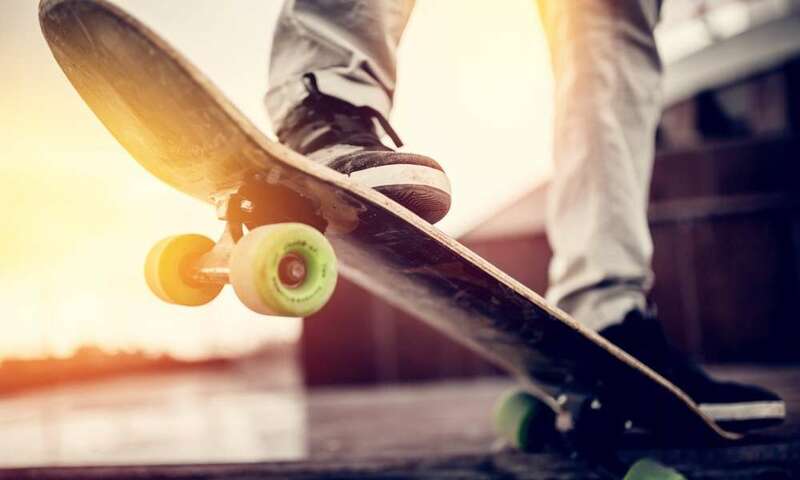 Additionally, you have total control over the speed of your skateboard and it can travel up to 12.5 mph and has two different riding modes and a positive braking system to ensure you stop when you need to. Also, this E-GO2 electric skateboard has up to an 18 mile range which means you will have no problem commuting from place to place without running the risk of your battery dying and having to carry the scooter home with you. You will have your choice of color when it comes to this skateboard as you can choose between three different colors: royal blue, hot pink, or mint green. If you want a cheaper option that is still going to provide you with a lot of the features you desire but won’t break your bank, then this might be one of the skateboards you desire. This 12-Volt Electric﻿ ﻿Skateboard has a ton of features such as a large, sturdy deck, a high battery capacity and wireless remote to control your speed and braking while on a ride. As mentioned above, there is a 23-inch, 7-ply maple deck that features a unique shape and a kicktail that adds even more control. The battery on this electric skateboard is also excellent as it is a 12-volt battery that works to power a 100-watt motor and provides up to 40 minutes of continuous ride time. Additionally, the patented exkate T2 Torsion trucks and the poured polyurethane wheels help to give you a quiet, smooth and silent ride each and every time you go out there. Additionally, the wireless remote control help to control the acceleration and braking to offer the maximum safety and easy maneuvering. This product can support up to 120 pounds. Quiet and smooth ride each and every time. 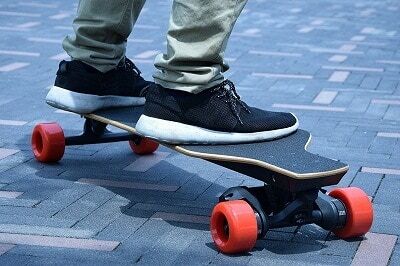 While the first product reviewed was one of the most expensive, this is the most expensive one and will provide you with all of the best features that you can find from this benchwheel dual 1800w electric skateboard. While the price tag is pretty hefty, you’re going to see why when you look at all the features. To start, there is a long board format and high speed wheels that combine to provide you with a great overall experience. In addition to some of the features mentioned above, you’re going to get two custom, high-powered brushless motors that work together to provide top speeds of up to 20 mph. Additionally, you’re going to enjoy strong acceleration and the ability to climb uphill as well as regenerative braking. The ergonomic 2.4G remote control provides all of your driving modes as well as direction. The wiring of this remote allows for the most accurate speed control when compared to any other competitor. If you don’t want the most expensive and you don’t want the cheapest electric skateboard, then you might find that this Airwheel M3 electric skateboard is one of the perfect choices for you to go with! It works to provide you with some great features you’ll love and you really don’t even need any previous skateboarding experience to fully master this board, although it would certainly help. 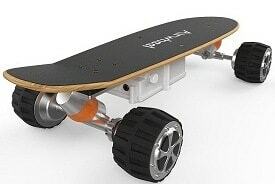 This electric skateboard is perfect because it allows the rider to focus more on carving and steering instead of using the time to get the skateboard going with a push-kick. Additionally, this M3 electric skateboard is bidirectional so that it can go both forward or backward and that can be changed at just a flip of a switch. Lastly, the massive all terrain rubber tires help to ensure that you can get the results you want to get from your skateboard so that you have a smooth ride. If you would love to have an electric skateboard but hate to see the price tag associated with some of them, then this Dynacraft Surge product might be one of the best skateboards to fit your needs. 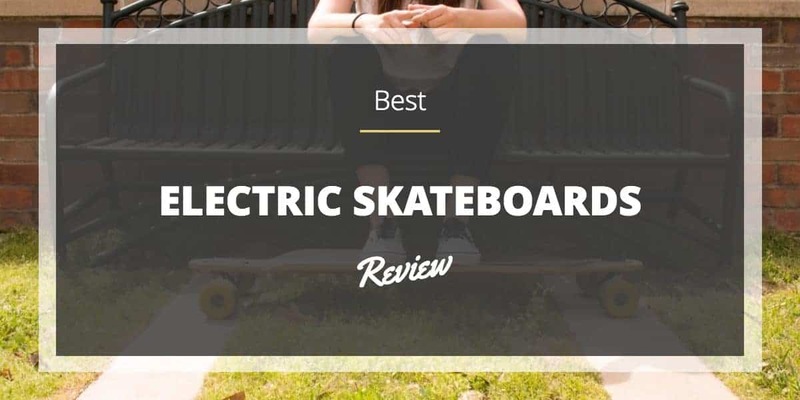 It is one of the cheapest options on this review post and still provides you with some features that are perfect for a beginner skateboarder or someone new to electric skateboards in general. 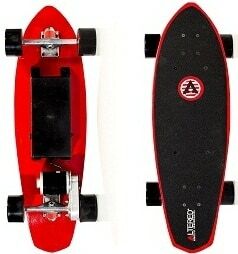 This particular skateboard is actually recommended for individuals that are 8 years old or older and have a maximum weight of 145 pounds, so while it might be adults that would love to own this, there are some kids that might find this Dynacraft Surge Electric Skateboard to be the perfect fit for them. Lastly, the black and lime green contrast helps to provide a beautiful contrast of colors that you’re going to love to have. Higher weight limit than usual at 145 pounds. When looking at scooters, you will notice that there are a lot of different features you can choose to make sure that you get the best model. This is probably one of the most important factors that you have to consider because you want to know exactly what you are using it for. Are you going to use it for fun? Maybe for commuting? Maybe all of the above? Whatever it is, you want to make sure that you buy the appropriate board for it. If you plan on commuting with it, then you want to make sure you have a more dependable skateboard that won’t have as many issues as some of the other ones you might find. This one seems kinda silly, but it is a pretty important consideration to keep in mind. While you might not think you’re going to need to carry the board, think about the consequences if you are on the board away from home and the battery dies. The only way you’re going to be able to get it home is by carrying it, so make sure it isn’t too much for you to handle. Remember, just because a board is heavier doesn’t mean it is going to be more durable. This is something that is going to play a large factor in your decision no matter what you’re going to buy. Unless you are made of money, you’re really going to want to make sure that you don’t spend way too much on an electric skateboard. Additionally, you want to make sure that the money you are spending is well spent and you’re getting the features that you want to get from the skateboard. While this number isn’t going to be everything and it won’t tell you all you need to know about the motor itself, it’s important to consider the motor wattage before you go off and buy a scooter. In addition, make sure you are paying close attention to the gear ratios as well because those will also impact the speed and torque of your bike. As you can see, there are plenty of different things that you have to consider when it comes to buying an electric skateboard. While there might be things not mentioned in this post, all of this information is going to put you on the right path to making sure you find the perfect electric skateboard to meet all of your needs. How Long is a Skateboard?